TIKAD is an armed drone developed for combat roles by Duke Robotics. 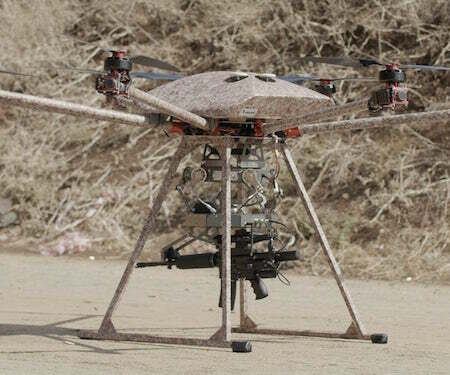 Now Florida-based startup Duke Robotics has unveiled the TIKAD, a custom-built multirotor that can carry and fire various military weapons, including semi-automatic rifles and grenade launchers. In an interview with Defense One, Atuar states the current device can carry and fire a variety of different weapons up to a weight of 22 lb (10 kg), and the accompanying promotional video shows how the drone is remotely operated. A human still needs to be on the other end to control the drone and weapon – at least for now. VIa NewAtlas and Duke Robotics.